Ferienwohnung-Am-Kurpark-Wohnung-3-150qm in Garmisch-partenkirchen is an apartment building. Located in Garmisch-Partenkirchen in the Bavaria region, Ferienwohnung-Am-Kurpark-Wohnung-3-150qm features a balcony. Guests staying at this apartment... have access to free WiFi and a fully equipped kitchen. The apartment has a TV. Museum Aschenbrenner is 700 metres from the apartment, while Garmisch-Partenkirchen City Hall is 1.4 km away. 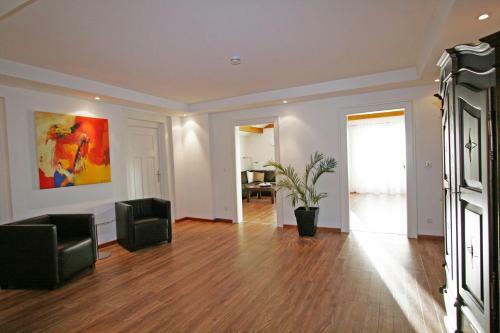 When would you like to stay at Ferienwohnung-Am-Kurpark-Wohnung-3-150qm? Payment before arrival via bank transfer is required. The property will contact you after you book to provide instructions. Guests are required to show a photo identification and credit card upon check-in. Please note that all Special Requests are subject to availability and additional charges may apply. Please inform Ferienwohnung-Am-Kurpark-Wohnung-3-150qm in advance of your expected arrival time. You can use the Special Requests box when booking, or contact the property directly with the contact details provided in your confirmation. Please note that prepayment will be required prior to your stay. It is not possible to pay cash on arrival at the property. After making your reservation, you will be asked to make your prepayment immediately. You will be contacted about this by Travanto Travel GmbH & Co. KG with further instructions. Payment is possible using a credit card, Paypal, Sofortuberweisung or Giropay.